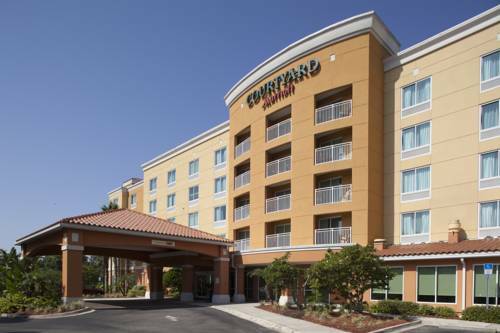 Plan your Jacksonville stay at one of the most attractive hotels in Orange Park, Florida - Courtyard Jacksonville Orange Park. Our location in Orange Park is only 20 minutes from downtown Jacksonville and 26 minutes from JAX-Jacksonville International Airport. Located conveniently off I-295 and close to points of interest in south Jacksonville and Orange Park, the hotel is close to NAS JAX, Orange Park Medical Center, AT&T, HCA Healthcare and world-class golf courses. Enjoy convenient work space in the privacy of your guest room or in the business center/lobby where free wireless Internet, oversized desks and ergonomic chairs make working more comfortable. Enjoy a delicious on-site breakfast each morning and a quiet dinner in the evening in our Bistro Restaurant featuring Starbucks Coffee. Our Orange Park, FL hotel, features unique, upscale meeting space that can accommodate groups of up to 150 people. We offer affordable group rates for any occasion. Reserve today and enjoy your Jacksonville stay ! - Bridgestone Flowtech America Inc.
~33 miles from Orange Park. ~79 miles from Orange Park.